Mechanical pumps alone cannot achieve the vacuum quality that is indispensable to producing the ITER plasmas (that is, one hundred billionth the density of the atmosphere). Once mechanical pumps have evacuated most of the air molecules and impurities from inside the vacuum vessel, another type of pumping device is needed to finalize the job and trap the remaining particles. Clockwise: Francina Canadell (European Domestic Agency); Eric Giguet (Alsyom); Michael Knaak (Research Instruments); Anthony Tremoulu (Alsyom); Matthias Dremel (ITER); Dirk Schmitz (Research Instruments). The laws of physics provide a solution—cold. Molecules, atoms, particles can all be captured by cold and the more intense the cold, the more irresistible its power of attraction. A surface cooled to a very low temperature will eventually "grab" almost every particle it comes into contact with. This is the principle upon which the cryopumps are based. Operating with helium at 4.5 K (minus 268.5 °C) the six ITER torus cryopumps, among the world's highest speed pumping devices, will create the high vacuum inside the vessel prior to a plasma shot and pump all exhaust gases during the plasma. They will also extract the helium ash from the fusion reaction along with the "unburned" deuterium and tritium nuclei. 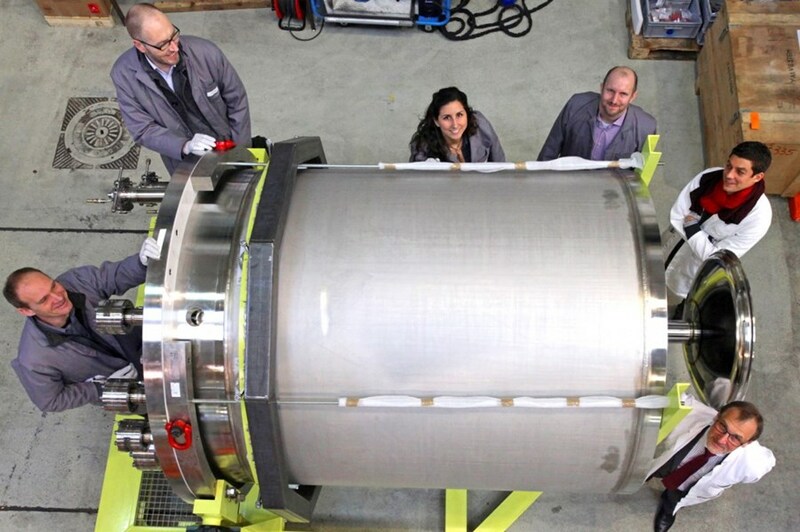 The 8-tonne, 3-metre pre-production torus cryopump will now travel to Germany, where components such as cryogenic surfaces, charcoal-coated panels and protective thermal screens will be installed. Last week, members of the ITER Vacuum Section travelled to Tarbes, in southwestern France, where Alsyom had just finalized the casing for the pump. The team wanted to make sure that there were no issues before the 8-tonne, 3-metre cylinder is sent to Germany to be equipped with its internal cryogenic circuits. 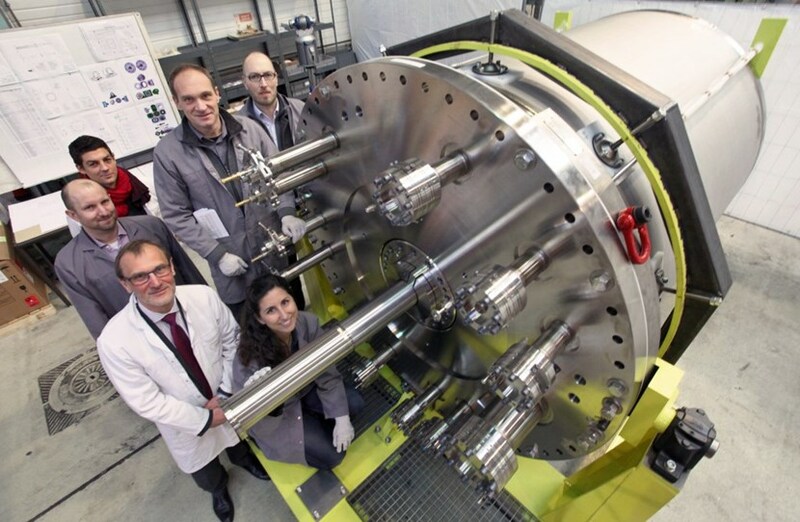 "The torus cryopumps are large, complex, high-precision components that will be exposed to huge temperature gradients in a very punishing environment," says Section Leader Robert Pearce. "Integrated in the pumps is the world's largest all-metal high-vacuum valve and it was an extraordinary accomplishment that our contractors were able to achieve 80-micron tolerances over such a large component with heavy welding." The pre-production torus cryopump will now travel to Germany, where specialists at Research Instruments will install its inner components—cryogenic surfaces, charcoal-coated panels and protective thermal screens. Once finalized and leak-tested, it will be characterized on a test facility and is likely to be the first pump to be installed on ITER.